Our Services - O'Laughlin Inc.
We are a family-owned and operated business located in Northeast Missouri. 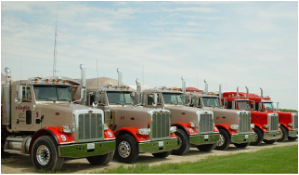 O'Laughlin, Inc. has been in business since 1950 and what originally began as a dump truck business has grown into a multifaceted business with many types of trucking services. Most of our local soil types call for at least some lime to correct low pH areas. Lime applications since the beginning of modern farming have proven very effective to correct those pH areas and therefore increase yield. In the past, lime was applied at broadcast rates of 1-2 ton an acre across the entire farm. The problem with broadcast applications is that soil pH varies widely in every field and therefore the lime requirement varies as well. It is not uncommon to see pH range from 5.2 to 7.8 in the same field. As a result, the lime required to correct that pH problem would likely vary from 0 tons per acre to over 5 tons per acre. Modern farmers use Variable Rate Technology (VRT) to reduce guess work and increase profit potential. 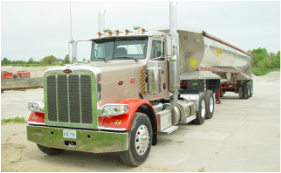 O'laughlin Inc. has the unique advantage of supplying quarry-to-field VRT service. The trucking operation hauls product from the quarry to your field stockpile and our expert operators spread the lime using a Case Titan Floater equipped with VRT technology. This is often achieved with a 24-hour turnaround allowing you to make the most of your window of opportunity. ​in Macon, Shelbina and Marceline areas.